There is growing tension in Ado Ekiti, the capital of Ekiti State, between policemen and officers of the Department of State Services after two cops were shot on the premises of the DSS in Ado Ekiti, leading to the death of one of them. It was gathered that the policemen, Sergeant Sylvester Malik and Corporal Mough Tergwu, were serving at the Special Protection Unit of the Nigeria Police Force in Lokoja, Kogi State. Sources said that the policemen were attached by the SPU to a former Executive Secretary of the National Health Insurance Scheme, Dr. Femi Thomas. 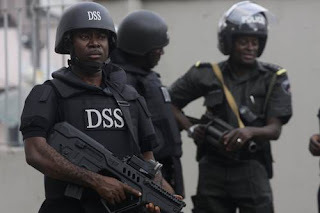 It was learnt that the DSS officers had stormed Thomas’ house in Ado Ekiti on Tuesday in three Hilux vehicles to invite the former executive secretary to their office in the state capital. The former executive secretary, it was learnt, followed the DSS officers in his Highlander, with number plate, FCT 408 ABJ. The two policemen were also said to have accompanied Thomas to the DSS office. Trouble, however, started on the premises of the DSS after some of its officials complained that the policemen were armed. It was gathered that during an argument, the policemen were shot. A source said the policemen offered to stay outside, that they could not hand over their firearms to the DSS men. It was learnt that Malik died immediately while Tergwu was rushed to the Ekiti State University Teaching Hospital. Malik’s remains were also taken to the hospital’s morgue. The spokesperson for the police in the state, Mr. Alberto Adeyemi, said the command was aware of the incident, adding that investigation was ongoing.